The trade tension between the US and China, the policy normalization by the US Fed and China’s curbing a record borrowing binge, the embattledBrexit from the European Union, and rising political cacophony across the globe, together mounted the fear of uncertainties and brought volatilities to the financial markets and caused a global market meltdown. 2018 has been proved to be a tough year for decent returns, cash have been among the best performing assets in 2018.In the time that investments fighting against volatilities, even tiny return would bea rare win. Although we think we have been through a lot in the past one year,it seems to be inevitable that we need to be prepared for more downside to come. It’s going to be very challenging moving into 2019 because we’re at the cusp of many turning points. We expect that the level of volatility we’ve seen in 2018 will be typical in this year. In the table below, we summarized our view on the global asset allocation in 2019. Volatility played a major role in financial market in 2018, the S&P 500 fluctuated more than2% in 16 days in 2018, the most since 2011. Even companies with good news to report have seen their stocks sold off, signalling we are amid a bear market. The stock valuations have also come down from previous highs. As the stock prices declined, the market is repricing stocks to a lower growth rate. Nevertheless, it doesn’t mean the stock prices have bottomed as the earnings estimates are expected to decline as well, as the 2019 EPS growth are being revised downwards since Q4 last year. Other than that, as the major indexes have broken the critical moving average levels in their recent fall, it typically takes some time, sometimes months, before turning up again. As similarly important, the US yield curve flattened in 2018, the gap between short-and long-term interest rates shrunken significantly. Over the past 30 years, when the gap between 2-year and 10-year Treasury yields turns negative, a recession follows, but it takes a period of time and certain condition. However, we do not see a recession on the horizon just yet, even though the US yield curve is close to inverting, we do not expect the credit cycle to end in 2019 and the chances remain low even for early 2020. It was not easy for the rest of the world either, many emerging markets were pummelled in 2018, part of their pain was driven by the US Fed hiking rate for four times in 2018. Literally all the EM currencies had depreciated against the greenback. There are undoubtedly idiosyncratic factors associated with countries such as Argentina, South Africa and Turkey, yet higher US rate reverberate throughout the world. The World Bank cut its forecast for the global economy in its January 2019 Report, amid the slowing growth in trade and investment, rising interest rate sapped momentum especially in emerging markets. The bank lowered the global growth to 2.9% from 3% from its previous projection and made a reduction of 0.5% to 4.2% growth for emerging markets. The expansion in the euro area has also be downgraded slightly. The bank indicates that the headwinds have caused some emerging markets and developing economies under significant financial market stress, result in higher downside risk in the coming year. The US government enters its fourth week of the partial shutdown, which is its third shutdown under President Donald Trump’s leadership, also the longest government shutdown in US history. The story begins with the president demands funding for a southern border wall, which could not get enough support from the Congress to pass, in an age of divided governmentwhereRepublicans are standing behind him and Democrats are against him.Hundreds of thousands of federal employees are going unpaid, 9 out of 15 federal departments and a number of agencies are affected by this shutdown. Only major programs like the military, Medicare, and Social Security are considered mandatory spending that are still operating. Funding for key safety nets, like food aid, will run out in a couple of months. Congress is now stuck, Democrats say they won’t negotiate a wall or border security until Trump reopens the government. In 2013, while more than 800,000 federal workers did not receive any pay, the Bureau of Economic Analysis estimated that the real GDP growth was consequently trimmed by 0.3%. The recent estimates from White House economists suggest that the shutdown this time will shave off 0.08% GDP per week, and the unpaid federal employees may temporarily be classified as unemployed so that mark down the January job data. The overall impact of government shutdowns in US history, however, were modest and bounced back as soon as the government reopened. Having said that, the shutdown which lasts for months rather than weeks could be a different story and more significant to the economy. The shutdown is not only triggering ripple effects across the US economy, indirectly, consumer spending could shrink, and business confidence might also be harmed. 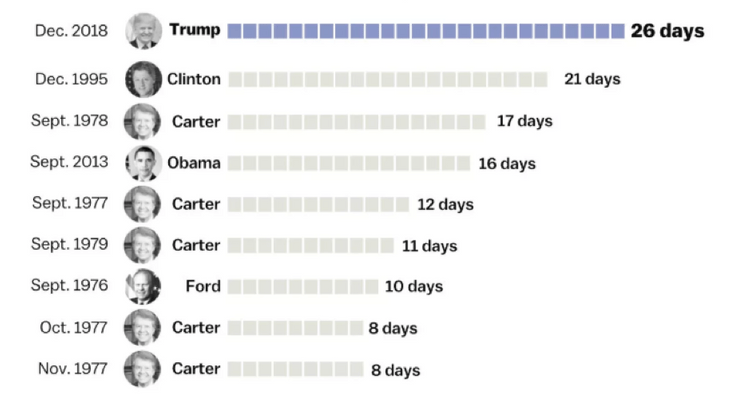 The longer the shutdown drags on, the more damage will be caused to the economy. The world’s debt has more than doubled from 15 years earlier, largely fuelled by government and corporate borrowing. US government debt, in particular, has risen at the fastest pace since 2012, total public debt outstanding has jumped by US$ 1.36 trillion, which is 6.6%, since the start of 2018 till December, and by US$ 1.9 billion since President Trump took office. The borrowing is needed to cover a budget deficit that expanded by an estimated US$ 779 billion in Trump’s first full fiscal year as president, the widest fiscal gap in six years, andwas equivalent to 3.9% of GDP in Trump’s first full fiscal year as president. The deficit shrank to 2.4% of GDP in fiscal 2015, but started widening again to 3.2% in 2016 and 3.5% in 2017, comparing with an averaged -2.13% from 1948 until 2017.By the end of Trump’s first term, the debt is expected to rise by US$ 4.4 trillion despite historically low unemployment, and relatively low interest rates and robust growth. The US current account deficit, on the other hand, widened to US$ 124.8 billion, or 2.4% of GDP, in the Q3 of 2018 from a downwardly revised US$ 101.2 billion, or 2% of GDP, in the previous three-month period and above market expectations of US$ 124.3 billion. This was the largest current account deficit since Q4 of 2008 as imports rose and exports fell. Current Account in the US averaged negative US$ 48.2 billion from 1960 until 2018. 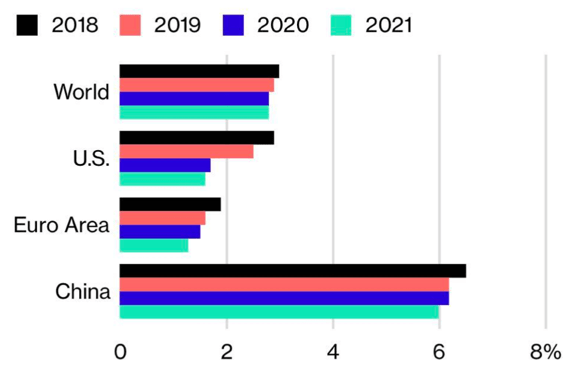 Besides the US debt situation, more than US$ 4 trillion of junk bonds and leveraged loans will mature globally over the next decade, with the maturity wall peaking in 2024, implies global investors could end up recovering substantially less in bankruptcies than they have historically. Investors have parked trillions of dollars in mutual funds and exchange-traded funds that buy junk bonds. As companies increasingly tap that market for their borrowings, those lenders are finding that there’s no one left behind them to cushion the blow. Today’s plunge in liquidity will produce increasingly higher volatility.It’s going to be a shrinkage of liquidity that triggers the whole thing, this represents a significant withdrawal of liquidity from the financial system. 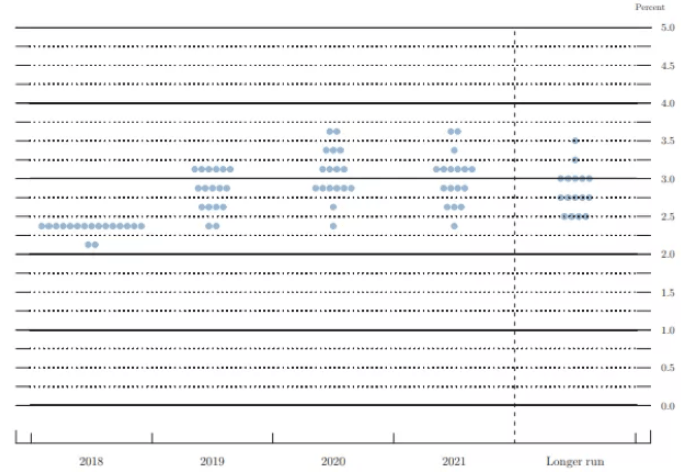 At every FOMC meeting, the Fed releases a summary of economic projections that included FOMC members’ expectations about the monetary policy levels, as known as the dots. Each dot indicates the value of an individual participant’s judgement of the midpoint of the appropriate fed fund rate. From the latest projections, the US Fed now expects just one to two rate hikes in 2019, less than it had previously forecast in September 2018. In addition, the Fed’s System Open Market Account (SOMA, the US central bank’s balance sheet) which contains dollar-denominated assets acquired through open market operations command attention. 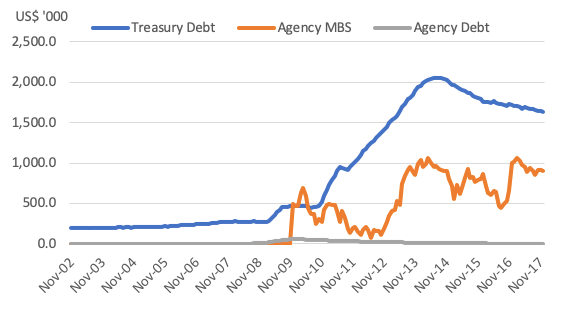 As in end of 2018, SOMA held roughly US$ 3.9 trillion of assets, largely kept in Treasury bonds, notes, and mortgaged backed securities, down from the peak of US$ 4.24 trillion in April 2017. In 2019, US$ 385 billion of the above assets are due to roll off. By the end of 2021, about US$ 1 trillion of assets will mature, which will reduce the liquidity of US dollar significantly. That said, the quantitative tightening in 2019 accompanied by the balance sheet shrink implied a potential rate to be slightly higher than 3%, and it shall probably take the rate to close to 3.5% in 2020. Having all the obstacles we could expect in 2019, there are still positive signals in the markets. Within just eight years of the global financial crisis, the US was the only non-emerging market economy with record GDP. The nation’s growth has exceeded the Group of Eight leading industrial countries’ average every year since 2012. During the financial crisis, more than US$ 37 trillion of losses in global equity markets has been triggered, unprecedented losses were also seen the US housing market, but real estate was the best performing industry in the US during the first 15 months comeback. The US unemployment rate, on the other hand, has plunged to 3.7% from 10% since 2009, a sharp drop than in any other developed economy in the same period. In 2018, 18 states in the US raised their minimum wages, in addition, 22 cities similarly raised wages. In 2019, it is believed that there will be even more regions with higher paychecks, 19 states and 21 cities and counties, are expected to raise the pay floors. Some of these wage increases are the result of scheduled, incremental increases set by states in earlier years. In fact, even without minimum wage legislation, companies are aggressively competing for workers by raising pays for starting workers. In 2009, there were 6.6 job seekers for each opening, today, there is less than one person looking for work for each opening. The labour force participation rate of 63.1% of working age Americans matches the highest rate in the past five years. We would also like to talk a little more about China. After two decades of fast economic boost in China, the momentum of the growth has slowed down, nevertheless, China is still one of the investment focus in 2019. Despite the threats of a trade war with the US, the Chinese economy is largely driven by domestic demand including commodities, financials, industrial companies, real estate and property developers, the China slowdown seen modest. Chinese property credits issued in US dollar has been though a shakeup in 2018 due to Chinese liquidity tightening, within the same rating bucket the credit spread are now traded with a 100 to 200 basis points difference due to above shaky market condition, nearly tripled from a year ago, that said, decent return can be captured with carefully selected names. Meanwhile, even though the US stock market has been through a significant correction in recent months, the valuations in China are still more compelling than the US, with a high likelihood of earnings upgrades than the other way around in 2019. Lastly, we reckon that the regulatory changes could also bring positive impact to the financial markets in China in the long run. In summary, we would expect 2019 to be a year of a hard-earned modest return and high market volatility. A shift to risk-off sentiment will lead to further investment outflows from riskier assets, we recommend balancing out the allocation with defensive posture. Therefore, a low volatility, low correlation to market turbulence asset which could deliver stable return should be prudential and optimal in the year of volatility when it comes to the portfolio management.